I love cross stitch but it’s so time consuming! Cross stitch on a computer is much quicker (Three cheers to Ctrl+c & Ctrl+v)! Hope your Christmas plans are coming on a treat ^_^ (I’m starting to enter ‘panic mode’). Click links below to open the pdf’s. 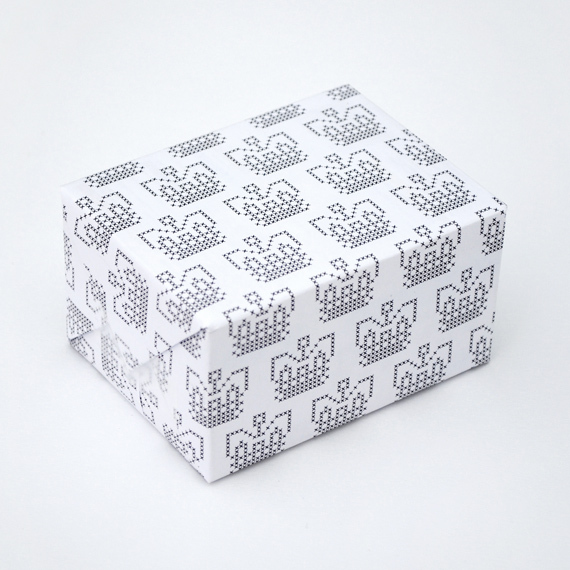 The designs will print out nicely onto A4 paper and are only suitable for little gifts (but we all know the best things come in small packages). 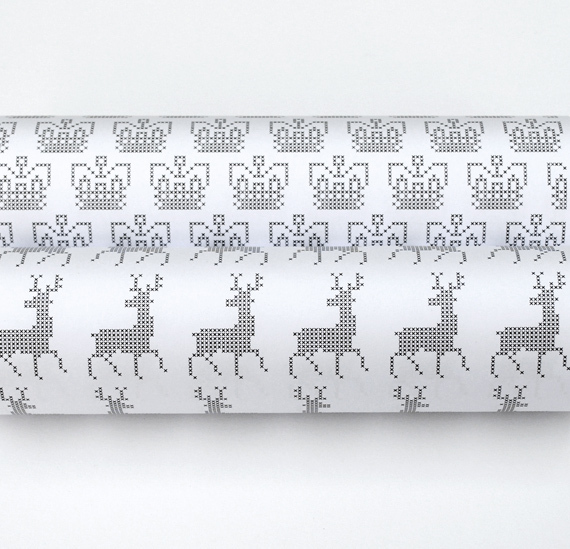 Thanks for posting this lovely wrapping paper! Love these!!! Thanks so much for sharing. Hi, at the moment the crown link is not working… Thanks for such nice things!! kate these are SO awesome! definitely using them for our white elephant gift exchange party this year, and maybe even a few small gifts for my husband! 🙂 Thanks for the printable. You’re always coming up with some beautiful prints! I love it! These are so pretty! 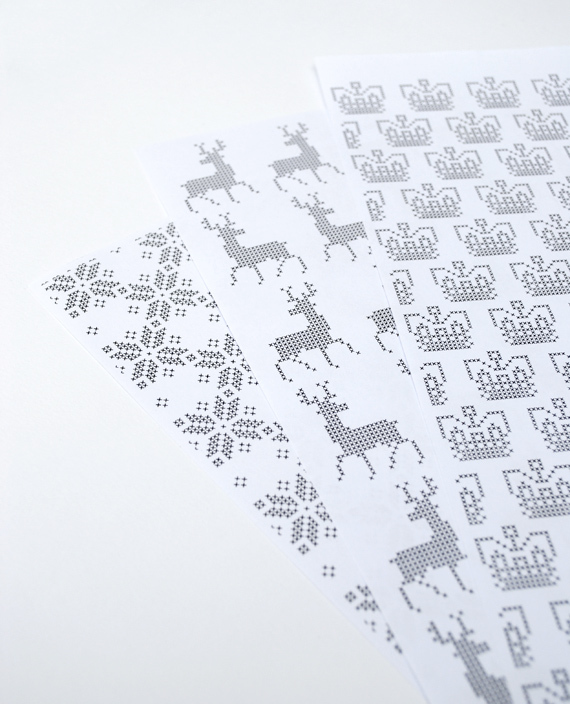 Love the ones with snowflakes and deers! They look lovely Høytrykk. 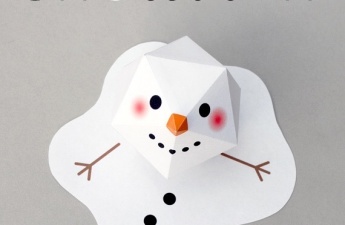 Especially love the squared paper. You even managed the star – hurray! 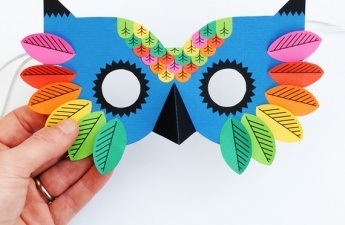 Love this and all your printables. I don’t know if you’ve answered this elsewhere (I checked your about and comments on other posts) but what kind of printer do you use? The quality looks amazing! Hi Emily. It’s just a regular Epson inkjet. Nothing fancy. Prints b+w really well not so good with colour (that’s why all my prints are in black and white!). When I print I use the following settings: ‘grey-scale’ and ‘text and images’. Hope that helps. Hi Kate. That’s super helpful, thank you! Kate I love these – especially the crowns. I have some neon ribbon that I think will go perfectly. Thanks for making my holiday wrapping a little bit cooler! I can’t seem to get this to work. When I hit the deer, snowflake, crown or invader button it just sits there blank. Am I doing something wrong? I am in the United States. Does that make a difference? Sigh. I am not very techy. Does that make a difference? Thank you for sharing, this is so cute! Thank you so much for posting these! They really helped add a personal touch to my gifts this year, without the additional headache of laying out the design myself. Will link! I was wondering if i could use your pictures in my blog. I would like to link your blog to mine. 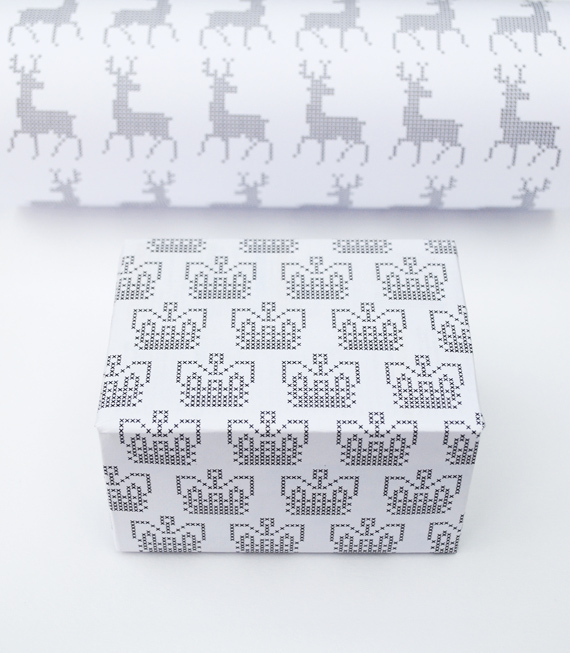 Great gift wrap I love your printables, really cute! I send an email to you 5 days ago but you might not have got it so I write to you here. 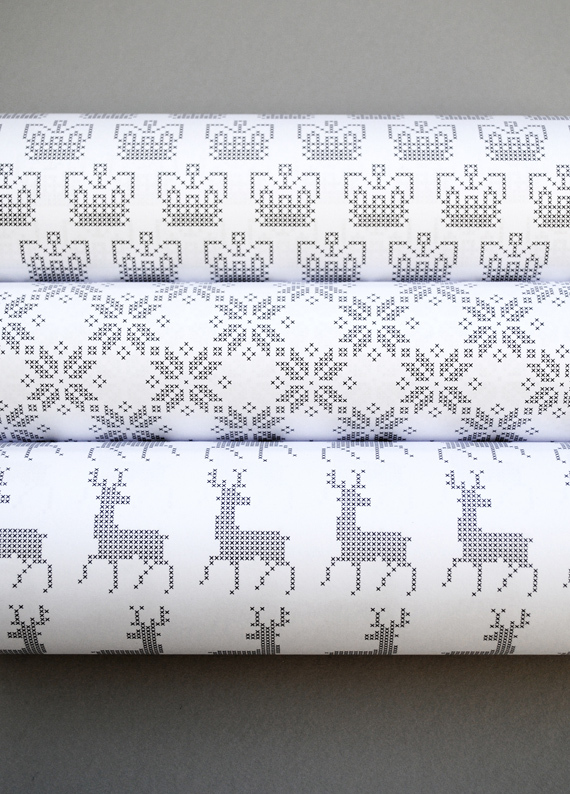 they day I saw these lovely cross stitch gift wraps, I made a few of them myself with different snowflakes and the Christmas tree. I would love to share it with you and other users but I don’t know how to do it as they are in my computer and not on the web! I might set up a flickr group account so people can upload their crafty photos…I just don’t have time to do this until after Christmas. If this is something you might be interested in then let me know. So glad you answered! no I don’t have pinterest nor facebook or… I made PDF files and I can send them to you and you can put it in this page, but here on your site there’s no option of attaching anything when you send an email. SO utterly beautiful! You are awesome to share this. Will be using this definitely! Thanks for sharing these lovely little papers. I haven’t seen this sort of thing since my oldest son was a kid. He used to stick paper in the typewriter and hit keys until the paper came out with pictures on it. No preplanning or anything. It always amazed me. Your patterns brought back the memory. I’ll find something to wrap up for him in some of this 🙂 He’s 44 now and likely can’t do it anymore. 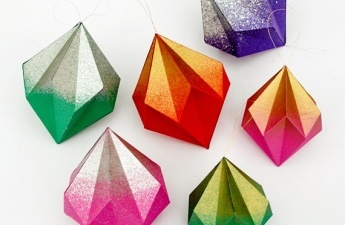 the idea is really cute..
will make very cute favor bags! This is so nice! Thank you very much. Invaders is perfect for my Hubs for Father’s Day. Thanks so muc! Hi ! just wondering what kind of paper you use? Lovely prints! I see a present that will fit these beauties just perfectly. Thank you! Thank you for this! 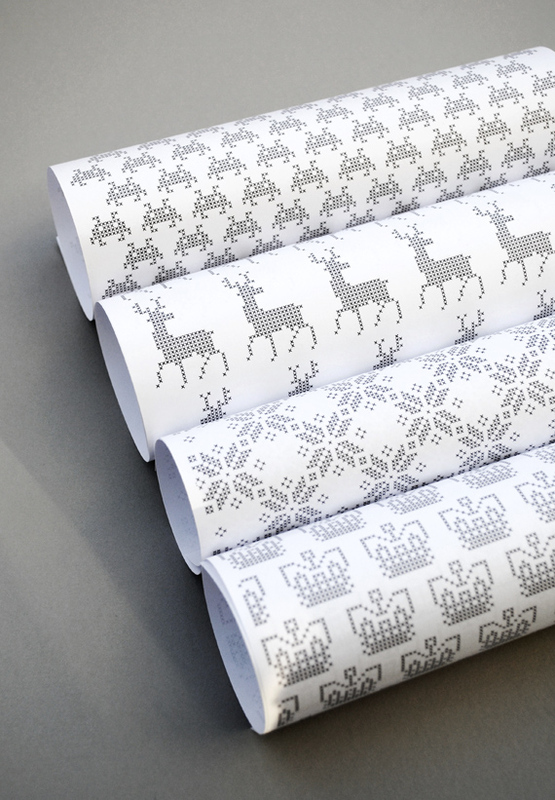 I tiled it on big paper for my plotter so that I can wrap my husband’s gift. I know he will appreciate the Space Invaders wrap! part in the 1989 FIFA U-17 World Cup held in Scotland. one setup, and be struggling to be at the back of the pack and having spent tires with the other. is the impact of viral advertising and marketing. viral is end, EWOm is a way, that i understand. Nevertheless, wildfire may be one of the simplest ways to explain viral advertising. Always searching for new songs to attempt. and formal social events, making them extremely purposeful to have in your present storeroom. SO cute!! Thanks for these 🙂 Just printed the deer and snowflake ones to frame and hang on my wall! Perfect even for after Christmas–I’m so glad I have an excuse to leave them up afterward. enough calcium to be used as calcium supplements.